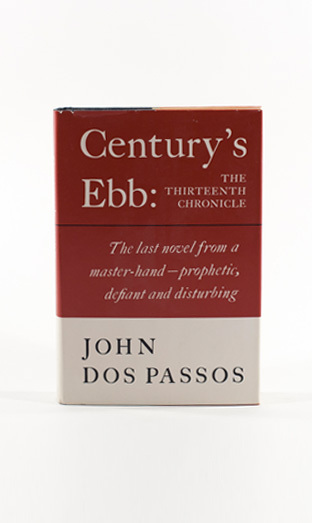 His final novel in a series of thirteen “contemporary chronicles,” Century’s Ebb, is published posthumously. As in the U.S.A. trilogy, Dos Passos contrasts the main action with biographical sketches of select figures from history, such as John Foster Dulles and Robert H. Goddard. Century’s Ebb is unrevised and incomplete, but its themes are evident. Against the slate of recent American history, Dos Passos celebrates the virtues of the farmer and finds connections between pastoral wisdom and democratic values in Walt Whitman’s writings. After a lifetime as witness to tragedy, the author ends his career in fiction with a chapter on his optimism for the U.S. Apollo program.